This accommodation cannot yet be booked on SleepOut.com. Find more accommodation options in Central Highlands. Mukima House was built on a grand scale in the 40's and has been recently rescued, rebuilt and refurbished. 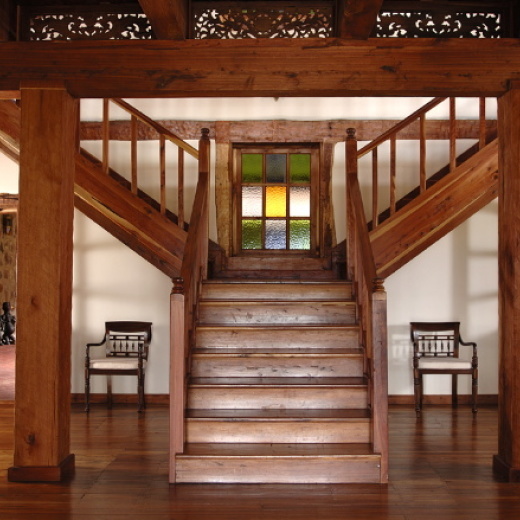 Hand made cedars floors, cedar windows and some dramatic cedar beams make this house one of Kenya's most exceptional surviving examples of a past era. Here you can unpack your bags and spend your holiday relaxing and soaking in the luxury and privacy of your own magnificent Kenyan home. We have a safari vehicle available your exclusive use during your stay. 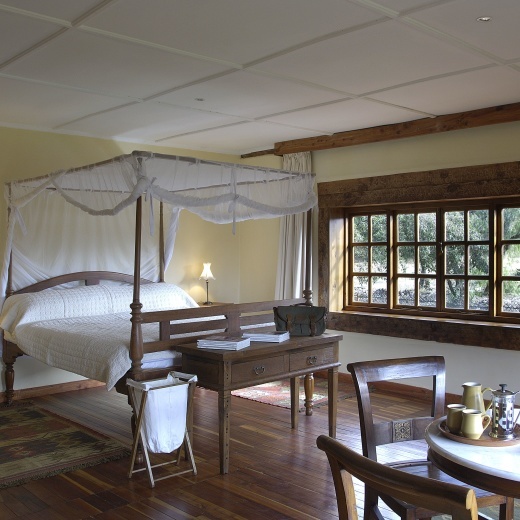 The house is beautifully situated on 360 acres of private conservancy, with a stunning view of Mount Kenya. Mukima House is fully staffed to ensure your every need, but the staff are very discreet, invisible perfect service is our aim. Within the estate is a swimming pool, tennis court, sauna, massage room, as well as fishing and row boats on the dam, badminton, croquet, table tennis, Samburu dancing, donkey cart rides, broad band internet, satellite TV/DVD, walks and fabulous bird watching. Game drives, walking safaris and horse riding can be arranged on nearby ranches and reserves, while golf and trout fishing are also available. The house stands on a 360 acre triangle, which was once a cedar forest. Evidence of the age and size of the forest can be seen in the timbers of which the house is built. There are clear views of Mount Kenya and the Lolldaiga Hills from all corners of the property. An electric fence, patrolled by a team of Samburu warriors, protect the land and its replanted forest of over 20,000 hardwood trees from the cattle and goats that were overgrazing and causing erosion. Trails have been cut through the bush, which are safe to walk and enjoy the birds, plants and insects. A large dam in front of the house, fed by ground water from Mount Kenya, provides safe haven to many bird species, including egrets, ibis, storks, pelicans, various ducks and breeding pairs of crested crane. A small herd of impala, bushbuck and reedbuck are breeding on the farm, while tree hyrax provide the appropriate night noises and the guinea fowl are becoming tamer. The clawless otter has been spotted on several occasions and we have a resident caracal, keeping down a growing population of guinea fowl and hares.